Economic Neoliberalism in its most perverse form has been recapturing the imagination of policy makers worldwide. It emerged in the context of a prolonged crisis, increasing unemployment and unsustainability in the public sector. Growth slowdown reflects several factors, including domestic errors of economic policies, lower commodity prices and structural bottlenecks. To overcome these problems, most of the dominant governmental proposals, reminiscent of questionable austerity strategies, reflect the Washington Consensus’ vision. Such a framework—mainly enforced by the financial elite and stimulated by the supporters of fictitious capital—underestimates the intricacy of fragile economies and does not answer some fundamental questions regarding their policies. Neoclassical-economics-based dominant austerity actions are not a proper scheme to deal with the vast challenges faced by some nations. Actually, we need a careful construction of a new multidisciplinary—socioeconomic, political, environmental—theory and programme to deal with the roots of our problems. This article sheds insights into the much needed new paradigm for those concerned about the required top-down reforms worldwide. It is easy to identify periods in which countries want to fully integrate themselves into the international market, counterbalanced by frequent calls for self-sufficiency and the need to strengthen State control over important sectors of the economy. Most actions taken by several governments have barely been internally consistent with fair economic development in the sense of tackling, simultaneously, the targets of sustainable growth, reasonable income (and wealth) distribution, as well as monetary stability. Most governmental policies tend to work like a frictional pendulum, dominated by confronting experiments and obstacles. Some countries are on the verge of socioeconomic collapse. The conflict between the need to avoid several fragilities and the powerful opposition from those privileged and corrupted by the current state of affairs is quite obvious. As pointed out by Teixeira & Ferreira (2015), in most of the countries, the economic system is more and more deeply in the hands of domestic and international finance, and the value of capital is to a large extent fictitious, bearing only a very remote relation to assets that it actually represents. It means that we are in the world of “financialization”. The present power of fictitious capital dominates a significant part of the relationship between debtors and creditors. The debtors have difficulties in meeting their financial obligations since the creditors set severe conditions that the debtors have to meet. Such hegemony violates fundamental values and principles on which a democratic and fair society must be based. We need a new comprehensive and multidisciplinary socioeconomic theory that markedly differs from the present situation and in this vein makes a positive contribution in setting the ground for a new framework. The search for a new vision involves burning political and socioeconomic issues. Without a profound humanistic theory, which can produce significant actions, we are risking increasing uncertainties about democratic civilization. Contemporary financial system exerts a devastating power over the majority of society with the implementation of targets mostly linked to their non-humanistic preferences and magnitude of their perverse influence. Some of the social implications of the neoliberal economic view over humanity are too obvious, including the negative impact of rising levels of inequality on overall welfare and the recurring economic crisis. Besides, in many ways, such a paradigm stimulates conflicting rather than co-operative behaviour; no single economic policy fits all states and regions. In most countries we have enormous regional and socioeconomic disparities. Opportunist economists and politicians, to a large extent financed by the banking system and multinational organizations, simply reiterate the need to follow the path of orthodox stabilisation, standard monetary and fiscal adjustments—“la Nave Va,” as Fellini called it. In this vein, alienation, corruption and fragile institutional arrangements lead to considerable problems. When wrongdoing involves ignoring lamentable political stress and persisting in sticking to treatments that are not working, we cannot excuse the heavy State apparatus from the roots of such affairs. On the other hand, it is rather suspicious to suggest that the market is prepared to guide its proper role, without fair controlling mechanisms by society and desirable institutions. The reasons are straightforward: i) one has to be very careful in making ‘naïve’ neoclassical analyses a success or a failure in the short and long terms in economic strategies generally; ii) it is necessary to understand the complex institutional conditions of each country; iii) the 2008 international economic crisis generated broad skepticism among serious decision makers worldwide, but the impact of such disturbance was not enough to stimulate innovative ways to engage policy makers in a solid shared new vision to correct the dominant approach. As it is well known, historically, most economies have been involved in profound forms of financial manipulation, creating unheard-of profits and manipulating interest rates for both domestic and foreign speculators. Furthermore, money switches quickly from a once highly valued sector to another, in the same way it moves from country to country, despite some domestic attempts to bring up a “favourable climate” for investors. Schumpeterian innovations are scarce, but the financial and political retribution to the “fictitious entrepreneurs” is almost unbounded. It is necessary to make a clear distinction between desirable investments and speculative ones. It happens that in this epoch of fierce globalisation and prevailing vision based on the extreme form of neoliberalism, international finance follows two paths that often cross each other. One is that of multinational corporations engaged in acquiring and creating enterprises, extending their influence but rarely expanding towards fair competition. The other is the international funds, channelled to many economies in search, essentially, for fast and non-risky returns on investments. This “financialization” plays a pivotal role in contemporary capitalism. As pointed out by Saad-Filho (2011, p. 244), it “… facilitates the concentration of income and wealth and supports the political hegemony of neoliberalism through continuing threats of capital flight”. In virtually all major industrial nations, an important component of wealth and income inequality is the prevailing increase of revenue at the top of the income pyramid as pointed out by Piketty (2013). The same phenomenon occurs in the emerging countries. For instance, in the case of Brazil, despite the relative economic success, mainly in the first decade of this century, regarding policies to reduce poverty and actions to increase minimum wage, personal and functional income and wealth distribution are so unequal that Brazil still ranks the first amongst the most unequal countries in Latin America. In recent years, the “dispute settlement system” changed again, intensifying and widening the gap between the very poor and the very rich. The socioeconomic elite, to a large extent associated with the financial system, have been getting rich faster due to well-known adopted measures, including corruption. Rapidly rising expectations from the past are being substituted with frustration and tension nowadays. De-industrialization, increasing rate of inflation and unemployment accompanied by declining real wages are becoming dramatic. This also occurs in many other nations. In 2015, the neoliberal economic policies which the authorities tried to impose on Brazilians have perplexing components concerning the nation’s fragile socioeconomic reality, elevating the portfolio of a “social strata” whose profile is easy to identify. Naturally, the country needs a modern infrastructure, reduction of the bureaucratic process, to pay attention to fiscal policy, to take action with regard to high pensions and super rents in the public sector, to punish corruption, etc. It is required to make the country adapt fair integration into the global economic system and changes in social aims and technology. It is necessary to improve education, public health, financial stability, basic investment in infrastructural sectors, etc. Such actions involve the forces of the market, but the state must play an acceptable role regarding the promotion and protection of the less fortunate in society. This means to seek development with human dignity, as pointed out by Bhaduri (2005). "The hard­est task is to change deeply held attitudes." In Brazil, as in many countries, capitalists love state financial support, but hate to take proper risk and embrace fair competition. Actually, governmental disputes and political parties are dominated by big enterprises and politicians financed by large-scale business. Financial control, fair labour relations, adequate industrial organization, necessary regulation and many other jargons, mainly emerge domestically in the form of an illusion. Unfortunately, it is often taken for granted that economic reforms of the kind suggested by different versions of the proponents of the Washington Consensus are a proper doctrine to use in similar situations [see Stiglitz (1998) for the opposite view on perverse monetarist approach, including the deepening of the mighty “financial market”]. This article is just a necessary step towards a deeper criticism in search for another order. The new order necessitates building up of a more humanistic theory and desirable policies to correct mistakes, including environmental ones, without penalizing the poor and an equal and fair distribution of wealth in all nations. Now that the disillusionment with the current state of socioeconomic and political affairs seems to be creating considerable distress, the need for a new vision may well get a fair hearing at last. The hardest task is to change deeply held attitudes. Jacobs & Šlaus (2013) summarize key elements for an alternative paradigm. In section II, we will summarise and criticize the dominant literature and then pay attention to a scheme of growth, distribution and accumulation for an open economy in which finance and active government as a whole are essential. The environment is also a leitmotif but needs to be given more emphasis. Section III, as an illustration, is concerned with the performance of the Brazilian economy in the light of the current scene of potential diving into the quicksand of socioeconomic damage. We also criticise the prevailing version of the Washington Consensus as a framework to deal with the nation’s socioeconomic and political troubles. Section IV emphasizes the importance of fundamental questions not properly answered by the orthodoxy. Section V has our concluding remarks. We hope some of the issues discussed here will alert us on the necessity of a fundamental revision of the dominant economic theory and instruments to tackle the crisis and paradoxes which sustain the current socioeconomic policy. We need an alternative and a multidisciplinary paradigm to provide an alternative way to solve fundamental problems, not just for Brazil but for all countries. The basic neoclassical model of the capitalist process of growth and distribution is expressed basically in the form of a single good in a closed economy where the government plays an insignificant role. Such a scheme has a very simple feature and its deficiencies are very serious. It tends to evade fundamental questions on the role of money and investment. 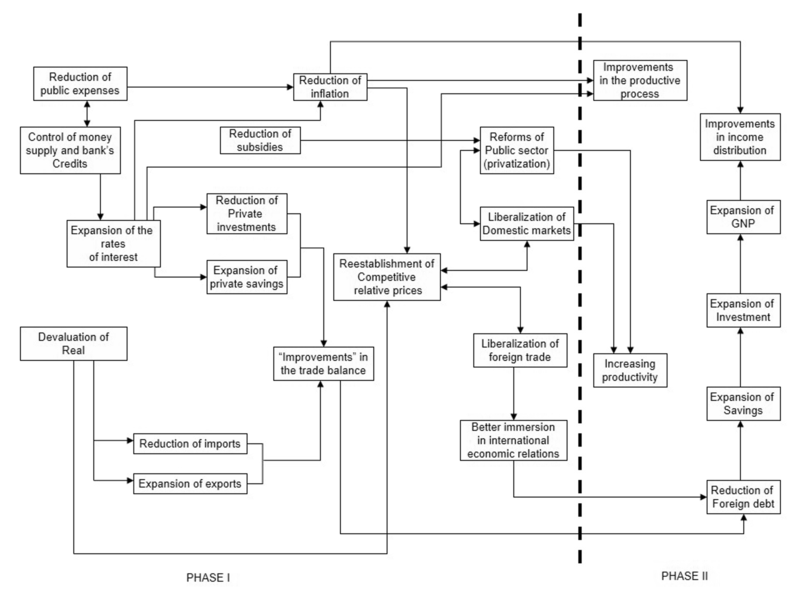 As a result, the dominant model fails to clarify the relationships among several issues which should be considered in the process of economic development. The degree of complexity in this matter can be better appreciated if we argue that the basic neoclassical growth model, besides the deficiencies already mentioned, does not take into account money and international trade. Also, the environment and waste are not included. Let N be the environment (land), L the homogeneous labour force and K the single capital stock. They are inputs to the flow of output, Q, leading to consumption, C, and savings, S. According to a very simplistic version of this neoclassical standpoint, the single good is both a production good and a consumer good. S has precedence over investment which is completely invested, expanding the stock of capital. Uncertainty is completely ignored. Before moving to figure 1, it is necessary to indicate that this simplified formulation of the neoclassical approach is supposed to conform with the “Occam’s Razor Principle” in the sense that models are not expected to provide full explanations. They are abstract and deal only with a selected number of relationships. The conclusions follow from the premises that models should contain as few components as possible. Surely, this is a methodological oversimplification; after all, we are dealing with social science. Furthermore, when conclusions follow from oversimplified premises, we are in the midst of a self-reinforcing circular argument, not a scientific truth or a model of the real socioeconomic and political world. Notice that the scheme above does not involve finance, and theoretically it is mainly concerned with production and expenditure of a single good, corn for instance. This is a simple starting point, an accepted preliminary construction, a barter economy, which will eventually be extended to include the monetary economy. Another interpretation would indicate that money is neutral. Some economists would also argue that in a modern credit economy the money supply is endogenous. It accommodates itself to the needs of trade, so that there is a reversal of direction of causality between money and expenditure as well as between savings and investment, but this is not the conventional view. A typical orthodox neoclassical interpretation of the simple scheme assumes the existence of a simple commodity and technological framework relating capital and labour. Land is neglected. Consumers maximise utility, given the budget constraints. Producers maximise profits, given the flexible relationship among inputs. Assuming perfect competition, the economic system would fully utilize capital and labour since they are supposed to be payable according to their marginal contribution (utility). The structure underlying such oversimplified vision tends to be perverse since, for instance, the prices of the environment/exhaustible resources are not taken into account. In such a decentralised institutional framework, involving pure competition, the behaviour of the agents is perceived, essentially, in subjective terms and “Say’s Law” thus applies. Actually, this approach does not provide a reasonable explanation for most of the troubles of any real economy even when we expand the output from a single commodity to multiple commodities, not to mention the role of corporations and the distorting power they exert over the theory and practice of modern capitalist economy. The limitations of the above approach are very obvious. Is mainstream economics prepared sufficiently to welcome open-minded discussion and in this vein to reduce the magnitude of its influence both in academia and economic affairs? Theoretically, what role should government play to counter or offset the distorting influence of the rising levels of corporate power, wealth and income inequality on markets? No doubt, the impact of rising levels of inequality on overall socioeconomic welfare and wellbeing merits careful attention. As pointed out by Teixeira et al (2015, p.148), “The common position on efficient allocation of resources remains founded on self-interest and Pareto optimality and is inadequate for treating the complexity of the real world”. Such premise is obviously irrelevant in a world in which egocentrism instead of cooperation is considered as the most important value to curb socioeconomic and environmental disturbances. Furthermore, the investment activity that is financed leads to variation in effective demand but we always need to pay attention to significant differences in the social and human value of speculative and fictitious investment versus investment in the real economy. For instance, what is “Capital”? To Marx (1983) it was a social, political and legal category. According to him, “capital” could well be money and machines, could also be fictitious capital, but the essence of it was neither physical nor financial. It was considered the power that gives capitalists the authority to make decisions and to extract surplus labor from workers. In the neoclassical theory, resource utilisation assumed the dominance of a market clearing process involving either full employment or a natural rate of unemployment, and in the long term, balanced growth. These outcomes require a “happy” financial market. The focus of such analysis is the promotion of competition. Neoclassical economists tend to believe that such a mechanism will lead to stable equilibrium and maximal utilisation of disposable resources. This standpoint tends to ignore the special problems posed by the necessary transformation of demand for future resources into demand for resources now. Neoclassical apparatus is mainly concerned with resource utilisation but the real problem in modern capitalism is with resource creation and the distribution of income and wealth. In other words, how to expand investment (thus, accumulation, growth and employment) and how this process is financed. From a simple accounting standing point, as indicated by Keynes (1937; 248), “‘Finance’ and ‘commitments to finance’ are mere credit and debit book entries, which allow entrepreneurs to go ahead with assurance”. The existence of a satisfactory combination of these components may well be necessary, but not a sufficient condition to attain a high rate of economic growth, sustainability and simultaneous distribution. Thirlwall (1994) argues that the effective constraint for long-term steady growth, at a high rate, is the long-run rate of growth of exports, combined with the long-run elasticity of demand for imports in relation to the national income (output). Kaldor (1971), who dealt with conflicts in national economic objective, was one of the outstanding economists and policy makers of his generation to question the traditional foundations of the fiscal and monetary approaches, theories and policies. There are some relevant structural components missing in figure 1. On a number of fundamental issues on this theme, see Nagan (2015). He mostly writes about causes of the current challenges and opportunities so as to formulate an integrated and comprehensive strategy towards the promotion of an adequate change needed for well-being of a nation. Mollo & Teixeira (2008) argue that production, investment, finance, technological change, distribution of income, and institutional considerations depend on macroeconomic conditions that have to be built. For this, a fair and active State is necessary. Dynamic configurations cannot be ignored, since they provide the boundary conditions allowing firms and consumers to function. A profound appreciation of the environment is also fundamental from the point of view of a long-term perspective. Such a complex process cannot be conducted without proper State participation. Adequate regulation is still more important under the condition of significant inequality of wealth, income and political power. Financial conditions are responsible for the pace of investment and innovation. Long-run interest rates have to be higher than short-run rates, warranting a liquidity premium to savers who choose to lend to long-term investors. But, at the same time, long-term interest rates cannot be higher than the return on capital, or they will inhibit investment. To tackle properly such difficulty requires a low short-run interest rate of public bonds in the market of liquid assets. This denotes appropriate conditions of finance to stimulate innovation and investment, thus increasing income and production. Even if part of the investment and innovation can be financed out of profits, they can be augmented if sound conditions of credit are improved and regulated to inhibit speculation. In general, persistent budget deficits can cause problems and there are attempts by policy makers to force some fiscal discipline forbidding the government from running excessive budget deficits. Sometimes, the legislation includes rigid rules setting an upper limit on deficits as a proportion of the tax revenue. When the government runs a persistent budget deficit it ends up with substantial debt. A widely used indicator of fiscal health is the debt-GDP ratio. A country with rising GDP can have a stable or falling debt-GDP ratio even if it runs budget deficits over time, provided that the GDP is growing faster than the debt. But this is a hard task since implicit liabilities occur in the form of pensions, social security, medical care and a number of other social expenditures over time. Seeking profits through investment and controlling the accumulation of capital and the process of sustainable economic development are subject to negotiations between the financial system, businessmen and the government. A profit-flows-based analysis of a real world economy requires that the scheme include money and banking from the very beginning. This is a fundamental requirement in a capitalist economy and one of the most difficult analytical and practical problems to be solved. History has shown that unconstrained market forces often lead to disaster. On the other hand, unlimited government centrality of economic decisions has promised more benefits than it can currently afford. It is obvious that any analysis that emphasises resource creation has to focus on investment. Actually, it is impossible to consider effective demand in capitalist societies without examining demand for investment. That is, how demand becomes effective and the way investment is financed. This being the case, if aggregate income and output are growing, normally, investment demand in the aggregate requires external financing. As pointed out by Minsky (1983, p.47), “An implication of this requirement is that under modern conditions money, as the liability of the banking or financing systems, is a product of the investment process. It is not possible to analyse the determinants of effective demand without considering the behaviour of those institutions in an economy that select and finance investment, and in the process that determines the price level of existing capital assets”. From 2008, the governments, in most of the economies, did not succeed in maintaining macroeconomic sustainability at acceptable levels of growth and employment. On the contrary, as the socioeconomic crisis erupted, human costs mounted and became an increasing threat posed to stability in most nations. The case of Brazil was, apparently, less explosive till 2014, but the level of the GDP obtained in that year was nearly the same as the value in January 2011. This and the recent crisis will be explained in the next section. Both instruments were applied as brakes to reduce the purchasing power under the presumption that it causes monetary expansion and excessive aggregate demand, thus accelerating inflation. In 1992, due to the effort of President Itamar Franco and a group of experts, the Real Plan, a Brazilian singular model to combat inflation, was successfully established and implemented. From 1993 the next president, Fernando Henrique Cardoso, was able to reduce inflation, but the cost of stabilization did not prevent the financial crisis of 1997 and 1998, in his second mandate. To tackle the issue, a number of institutional reforms were required to enable the country to seek broader goals of development. President Cardoso was committed to bringing down inflation and budget deficits, to liberalizing trade, privatizing state-owned enterprises, etc. Those having been done, he believed development would simply come true. However, such an approach, which emphasizes getting governments out was not successful from a historical perspective. * President Cardoso seems to consider that competition between public and private investment is not desirable, considering the former’s capacity to crowd out the latter. This theme is rather controversial. Most of the Brazilian population did not appreciate many aspects of his policy and his party’s candidate was defeated in the 2002 election. During the presidential administration of Luiz Inácio Lula da Silva (2003-06) and (2007-2010), redistribution of income via the expansion of minimum real wages, progressive social programmes and some control of the exchange rates allowed an expansion of the middle class, household borrowing and the creation of new jobs. Large formalization of the working force was also attained. In its efforts to reduce the impact of the 2008 international crisis, and to not make the mistake of creating too limited anti-crisis policies like Europe did, the Brazilian government may have exaggerated its anti-crisis actions. The neoliberal press praised President Lula da Silva, arguing that social gains were sustained and market credibility was kept through a combination of policies based on i) inflation target and some central bank independence; ii) almost free floating exchange rates; iii) relative tight fiscal policy. Most of the population and the owners of the fictitious capital were happy. The former President’s relative success was also due to the increasing demand, at excellent prices, for Brazilian commodities in China. During that period, Congress was dominated by a coalition of various forces, most of which supported such strategies involving semi-redistributive economic policies. However, the deindustrialization of the country, which started in the 1980s, continued. Lula did not take advantage of the positive economic results to do some essential structural changes. It was necessary to tackle the problems of infrastructural investment instead of protecting fictitious capital, to stimulate competitive technological advancement and to consider a number of institutional reforms. This optimistic epoch was followed by the period in which Dilma Rousseff (2011-2014) turned out to be the President of the country. Her administration continued to deliver some gains to the working class in terms of employment and social equity. But her strategy was hampered by a number of strategic economic mistakes. She did not understand that the economy was not in good shape any more. Her programme included badly guided actions to support selected industrial sectors, which proved counterproductive, relegating to the sidelines the importance of various features of the Brazilian economy. As time went by, her macroeconomic policies became even more unbalanced. Her main strategy was to continue the strategy towards increasing domestic consumption, despite the well-known criticism of wage-led growth. Kaldor (1971) was highly critical of consumption-led growth policies that neglected the foreign trade sector. During the presidential political campaign in 2014, Mrs. Rousseff was very unrealistic regarding the real situation of the country, despite obvious problems she was encountering, from the beginning of her mandate in the conduction of her economic policy. Notice that the presidential election of October 2014 was much mistrusted, involving disgraceful disputes among candidates, mistaking financial support to the parties and the ample corruption involving the links between the public and private enterprises became too obvious. During the political campaign, she was very critical of the relevance of alternative economic proposals. But, as soon as she won the election she was compelled, due to the political circumstance, to follow, to a large extent, the opposition counterpart, which had only a limited and conservative alternative macroeconomic programme. Indeed, the political support she got from the Congress and society was very less. Actually, she got lost in political and judiciary troubles. Nobody knows if she will complete her mandate. By the way, the average labor income of workers which increased till 2014, started to drop by the end of that year. To resolve the mentioned deepening damages, her government placed, at the end of 2014, a typical neoliberal economist from Chicago in the Ministry of Finance (Joaquim Levy). Unable to implement his simplistic and non-popular austerity initiatives, in December 2015, she replaced him by Nelson Barbosa, an economist who conformed more with her view. The new minister’s main mission is to match the surplus of tax revenue in 2016 with the “Hope Speech” message to get the economy back on track in 2017. This is a hard task. During her first mandate, too many mistakes were committed such as easy credit boosting demand for consumption goods and insufficient care for supply, backed by her limited understanding of Keynes (1936) and post-Keynesian economists. In this circumstance, power scattered among groups of politicians, big businesses and the profit seeking rentiers. According to our understanding of Kalecki (1943), even higher profits for such group or class do not, necessarily, change their views and opposition since the government-intensive and efficient action (which is not normally the case) would imply an undesirable change in the balance of power. Is Brazil an interesting country for private investors nowadays? Actually, they prefer to take advantage of the fictitious capital. After all, the domestic financial system is very profitable but bankers do not want to get embroiled in a political debate where their customers have divergent views. Fig. 2 shows a scheme with phases I and II of the Brazilian version of the Washington Consensus as the dominant economic engine, where credit and fictitious capital play the central role. In section IV we will deal with some fundamental questions. At this point some questions come to our mind: i) Why do sympathizers of the Washington Consensus deliver the same medicine to each ailing developing country? ii) Is it the case that the proposed policies are only introduced if they are in the interests of the domestic oligarchy who will retain wealth and privilege whatever its socioeconomic impact on the people of a nation? iii)Why do orthodox packages of austerity adjustment systematically bring about recession, unemployment and further polarization of income and wealth in countries with basically no social safety nets to protect ordinary people? iv) Why is it that the financial system is so fiercely protected in its speculative operations around the world? v) Are conventional policies implemented because it is believed they really overcome crises in developing countries or are they mainly designed to benefit financial interest in the domestic and advanced capitalist world? vi) Why, in theory, do financial authorities support democratic institutions when, in practice, they undermine the democratic process by imposing imprudent policies that hurt ordinary people and lead to social turmoil and democratic setbacks? vii) Why is the adjustment crusade for internal balance (fiscal responsibility) and external balance (current account equilibrium) always pushing for the reduction of real wages? vii) Last but not least, what should be a fair fiscal and monetary stance of developing countries in the face of recession or economic downturn? These are some fundamental questions that require a convincing reply. Unfortunately, the proponents of Washington Consensus prefer to apply their approach without answering relevant questions. The country needs sounder socioeconomic policies to guarantee the necessary conditions for stability, equilibrium, growth and distribution. The required fundamentals may involve a new set of components: i) adequate real rate of interest; ii) inflation rates similar to those of the main international partners; iii) stable and sustainable budget adjustment to achieve long-run equilibrium; iv) competitive and predictable exchange rate; v) creation of working posts; vi) improved distribution of income and reduction of public discontentment; and vii) creation of safety nets to protect the common citizen. The points above raise further important considerations. For instance, what do we mean by competitive exchange rate? What is the real exchange rate in equilibrium? This ratio depends on the nominal exchange rate and of the prices of non-tradable goods and services. Naturally, it is difficult to have control on the prices of international tradable goods. In the long-run, the real rate of exchange is an endogenous variable. It should be compatible with fairness and sustainable development, and not have its head in the clouds. Scholars of different schools of thought must be invited to take great care of structural changes, the dynamics of prices, production, employment, productivity, human dignity, socioeconomic fairness, environmental sustainability, safeguards for our collective well-being as well as effective governance. Macroeconomic policy should be based on the benefits coming from proper investments in health, education, ecological infrastructures within a democratic political system. Actually, although conventional thinking still tends to believe that crises stem mostly from uncertainty, exogenous and unexpected events, they occur not at random but through the dissociation between fictitious and the real capital, the circulation, production process and injustices which result in further consequences. Most prominent economic models associated with orthodox adjustment programmes have not brought fairness and income distribution to the centre stage. The typical policy packages to promote structural adjustment have been mostly addressed to meet the demands of fictitious capital. We need a broad and serious alternative analytical framework that takes into account the peculiarities of many nations. This involves a serious change in the socioeconomic theory which must have human dignity and sustainable development as its goal. Nowadays, we tend to appreciate more and more fairness in wealth and income distribution and the need to preserve our environment. A straightforward conclusion of our article is that the potential fruitful scientific cooperation among economists and other social scientists needs to be strongly emphasised if society as a whole is to successfully face the multi-dimensional challenges posed by an expanding range of issues. This task requires a profound rethinking of the conventional accounting system, where fictitious capital plays a damaged role. We consider the basic argument that the neoclassical model does not even approximate the real world as very important in order to understand what is happening in the planet. It raises several fundamental theoretical and empirical questions related to markets, money, and institutional power which we hope will stimulate the search for an influential alternative human-centric approach. Our article pinpoints the unsatisfactory state of socioeconomic and political affairs. Perhaps, anxiously, or ambitiously, we have tried to locate steps to a multidisciplinary, humanistic and meaningful theory. The implications of our prospective vision are far-reaching, as the growing number of people and institutions may realize. Bhaduri, A. (2005). “Development with Dignity: A Case for Full Employment”. National Book Trust: New Delhi, India. Bruton, H.(1998). “A Reconsideration of Import Substitution”. Journal of Economic Literature, Vol. XXXVI, June, pp.903-936. Dobb, M. (1960).“An Essay in Economic Growth and Planning”. Routledge & Kegan Paul: London, England. Jacobs, G. & Slaus, I. (2013). “From Limits to Growth to Limitless Growth”. In “Introduction to the Third Age”. Published by O. Giarini. The Risk Institute. Special Edition. European Papers on the New Welfare, no. 18: Trieste, Italy. Kaldor, N. (1971). “Conflicts in National Economic Objectives”. Cambridge University Press. Vol. 81. Kalecki, M. (1943). “Political Aspects of Full Employment”. The Political Quarterly, V. 14, pp.322-331. Keynes, J. (1936). “The General Theory of Employment, Interest and Money”. Macmillan: London, England. Keynes, J. (1937). “Alternative Theories of the Rate of Interest,” Economic Journal, 47, June , pp. 241–52. Marx, K. (1983). “O Capital; Crítica da Economia Política”. Volume 1.Coleção “Os Economistas”. Editora Abril Cultural: São Paulo, Brazil. Mollo, M. & Teixeira, J. (2008). “Macrodynamic Capability: Concept and monetary and financial conditions”. In “Dynamic Capabilities Between Firm Organization and Local Systems of Production”. Edited by Leoncini, R and Montresor, S. Routledge Edition, Taylor & Francis Group. : London, England. Minsky, H. (1983). “Notes on Effective Demand: Comments on Bharadwaj” in “Distribution, Effective Demand and International Economic Relations”. Edited by J. Kregel. London: The Macmillan Press Ltd, pp. 43-49. Nagan, W. (2015). “Introduction to the New Paradigm of Political Economic Theory”. Eruditio, Volume 2, Issue 1, Part 1. November. Piketty,T. (2013). “Le Capital au XXIeme Siècle” Éditions de Seuil: Paris, France. Saad-Filho, A. (2011). “Crisis in Neoliberalism or in Contemporary Capitalism”. Socialist Register. Stiglitz, J. (1998). “Distribution, Efficiency and Voice. Designing the Second Generation of Reforms. Proceedings of the International Seminar on Asset Distribution, Poverty and Economic Growth”: The World Bank and the Cabinet of the Minister of Land Reform, with the Support of II CA; July 14-17: Brasilia – DF, Brazil. Teixeira, J.& Ferreira, P.(2014). “Fictitious Capital: Illusions & Paradoxes”, Vol 2, Issue 3, October. Teixeira, J. & Pinheiro, D. & Vilasboas, A. (2015). “Socioeconomic and Environmental Performance: A Composite Index and Comparative Application to the USA and China”. Cadmus Journal, Vol. 2, Issue 5, October. Thirlwall, A. (1994). “Growth and Development.” 50th edition, Macmillan Press Ltd.: London, England.